At CES 2015 Sony introduced new products, partners and experiences to its evolving SmartWear range - a sleek stainless steel edition of SmartWatch 3, new Lifelog collaborations, and concept wearable devices, including a multi-sensor, waterproof headset prototype, from Sony Corporation, designed for optimising performance and providing real time insight on the running track. "Our approach to smart, wearable technology is based on the fundamentals of building depth and variety in user experiences, and providing choice with beautiful, functional products," said Peter McKeon, Managing Director, Sony Mobile Communications Oceania. "The expansion of Lifelog - both in terms of its open API and our vision for new wearable concepts - will allow creative partners to integrate their apps and services to our platform - giving our users access to the richest, most varied wearable ecosystem." At CES last year, Sony first showcased SmartBand SWR10 – a 24/7 wearable device; fully waterproof1 (rated IP58) despite its exposed microUSB port. A light, unobtrusive wearable that first featured Sony's modular approach – the independent "core concept" – it allowed the technology to be worn in different colours and styles, to suit individual taste and personality. 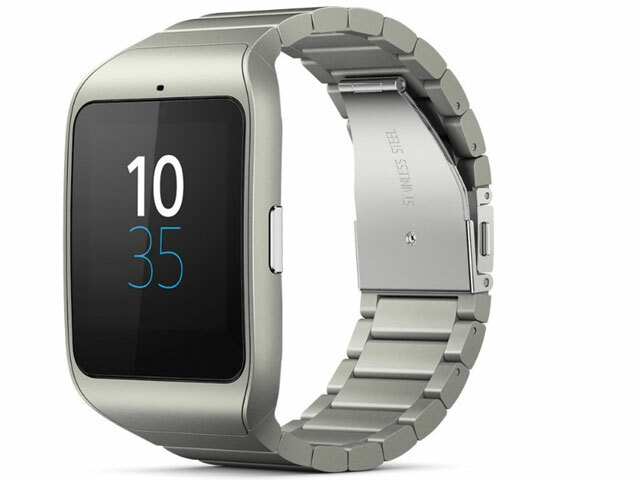 After launching in partnership this past Spring with Google, SmartWatch 3 is Sony's latest generation "SmartWatch". SmartWatch 3 in beautiful stainless steel matches contemporary with timeless aestheticism for a premium look and feel. It features a 1.6" 320×320 TFT LCD Transflective display for visibility in bright sunlight, and is of course water protected2, rated IP68 – it charges via a standard microUSB port. Even without your Android smartphone, SmartWatch 3 is a fun and useful accessory with impressive standalone functionality - featuring native music playback, intelligent sensor technology and a unique inbuilt GPS sensor. Golfshot and iFit are two developers already creating Android Wear experiences with SmartWatch 3's standalone capability, for both performance on the course and track respectively – from January*, every SmartWatch 3 user will have exclusive access to the premium Golfshot and iFit apps out of the box3. Sony also announced a new collaboration with Virgin Atlantic – to explore SmartWear initiatives together, to develop unique solutions using Sony's SmartWear products to support operational activities and enhance the customer service experience for Virgin Atlantic customers. More news will follow over the coming months. Users can now access Lifelog through their browser at lifelog.sonymobile.com. It's a new web interface that uses the open API functionality and latest HTML5 technologies, for a more visual experience. The site will work with any screen size, from your smartphone to your tablet to your TV - all you'll have to do is log in using your Sony Entertainment Network4 account. The new feature reflects Sony's strategy to regularly bring new functionality and features to Lifelog, to keep the experiences as current as they possibly can be. "Lifelog is inspiration through insight, and our first partners are helping us bring this to life in new ways" said Peter McKeon, Managing Director, Sony Mobile Communications Oceania. "We specifically designed the Lifelog platform on open principles, with capability that will help developers to build new experiences and access the Sony ecosystem like never before – it's going to be an exciting year ahead." Sony Corporation's Smart B-Trainer prototype was also introduced - a waterproof all-in-one headset style device with multi-sensor capability specifically designed for runners. The current prototype features inbuilt memory - and will provide voice coaching, as well as music playback, intelligently suggesting the most suitable soundtrack to accompany a runner during a workout. Follow @SonyMobileNews and #SonyCES for all the latest news, views and information. Thanks to Sony here is your chance to win a CD Radio Cassette Recorder CFDV8 for Christmas.